How do I listen to YouTube videos at double-speed? On the desktop I'm able to change the playback speed to 1.5x or 2x. With podcasts, I'm able to listen to them on my iPhone at 1.5x or 2x speed. Shouldn't I be able to watch YouTube videos at double speed on the iOS app? • Adjust video playback speed with new player controls"
You can, and it will cost you nothing. Change the speed controls just like you would on your computer. Play the video by tapping it and it will use the new speed settings. *If you're in YouTube desktop mode but still don't see the gear icon then tap Safari's action/share button and request desktop version from there as well. The request desktop icon looks like a monitor/iMac. If you lock the screen Safari will pause playback, but it can be resumed either from the lock screen or your headset to allow audio only. You can watch any YouTube videos on it at up to 2x the speed. Great for tutorials, presentations, and just saving time in general. Note: I'm one of the authors of the app. If you have any feedback please let me know! No, mobile versions often have much less functionality. With the official YouTube app there is (currently) no function to speed up a video. There might be an external app containing this feature, but by default there is no functionality for this. The Swift Player app should be able to accomplish what you need, but it is $3.99, so that might not be an option. I always use all three to watch tutorials and such. Uninstall youtube app if you have it. Go to App Store -> download "chrome". Open it and go to youtube.com. If you play the video you should be able to see the gear on the bottom right of the video player! 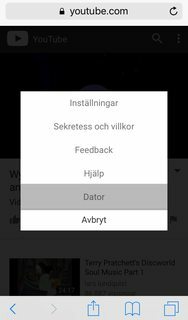 Tubex is a free (ad-supported) iOS app that offers a range of playback speeds and picture-in-picture support, in addition to all the usual YouTube functionality. You can install MyTube from the app store which is free (non-paid). During playback, click the box containing the number 1 and set your desired speed such as 1.5 or 2.0. Intermediate speeds such as 1.25 are unfortunately not available. The app is ad supported, so you might get a couple of ads as you interact with the app. Just install the Puffin browser and enjoy..
Not the answer you're looking for? Browse other questions tagged ios iphone youtube . What apps let you play a youtube video at 2x speed? Is there a way to force the youtube app to load videos in non-HD resolutions? How to make the Google search app open Youtube links on the Youtube app?